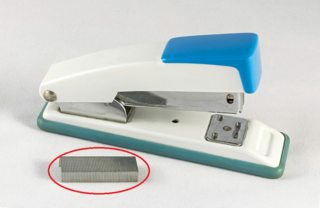 What is the filling of the stapler called in English? (you can see it in red circle in the attached picture). I looked for this word in my native dictionary but I didn't find this word. I'd just call them "staples". A set of staples joined together like this can be referred to as a "staple strip" or a "strip of staples", as in Eran's answer, but English speakers don't use this term very often. Instead, most speakers simply refer to them as "staples" in normal speech. That doesn't mean you can't talk about strips of staples. You can talk about whether a stapler takes half strips or full strips, for example – the shorter ones take half strips. But in common speech, it's usually most natural to just say "staples". In Wikipedia they're called paper staples. In Cambridge dictionary they're called simply staples. 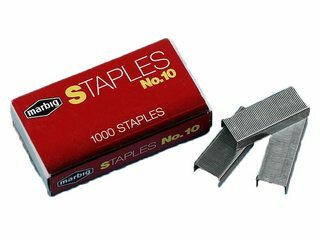 Staple strips, by googling I found mainly as a term that can refer to paper staples, but not as name of product title for them but just generally referring to what it is called. I found also that "staple strips" as a product title name refers mainly to the staples that are not for papers, but for example for thicker things than paper or fences etc. For "paper staples strips" there are only 5 results in google. Stapler needles is a name that less common in English speaking countries (for example, by googling I found 972 results, in which 46 results in the UK or 774 results in the US for "stapler needles"). I think it can tell everything about this usage. In our office we call them staple sticks or staple cartridges. But usually when you ask someone to give you those, you never mean to ask for singles, so even if you ask for just "staples", I'm sure you'll get a stick of them. I have always said "a row of staples" for the actual staples stuck together that you put into a stapler. From a marketing perspective, it has a dual meaning - a "staple" is typically a basic ingredient or material so widely used or consumed that it's considered essential to an everyday process. For example, rice and potatoes are staple foods in many parts of the world, cotton is a staple element of clothing. FSSAI bans stapler pins in tea bags from January 2018 - The Hindu Business Line, July 24 2017. Pencils, erasers, sharpeners, notepads, paper clips, even stapler pins – over the next nine years, Dandekar would stockpile stationery he never really wanted, and certainly did not need. 29 stapler pins removed from 10-month-old baby's oral cavity - Daily News & Analysis, May 6, 2015.
a "bolt" of staples is what you call the attached line of staples. What is this thing in browsers called in English?